The distinctive characteristics of the C96 are the integral Magazine in front of the trigger, the long barrel, and the wooden shoulder stock. Which gives it the stability of a short-barreled rifle and doubles as a holster or carrying case, and a unique grip shaped like the handle of a Broom. The grip earned the gun the nickname "Broom handle" in the English-speaking world because of its round wooden handle, and in China the C96 was nicknamed the "box cannon". Because of its rectangular "Box" internal magazine and the fact it could be holstered in its wooden box-like detachable stock. range and better penetration than most other pistols. The Mauser 25mm Mauser cartridge was the highest velocity commercially manufactured pistol cartridge until the advent of the .357 Magnum Magnum cartridge in 1935. 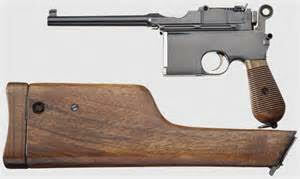 Mauser manufactured approximately 1 million C96 pistols. The number produced in Spain and China was large but unknown due to the loss, non-existence or poor preservation of production records from those countries. 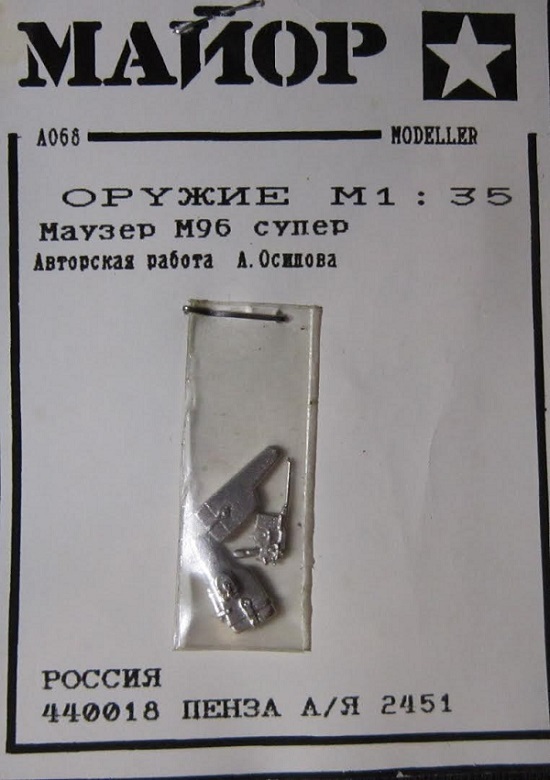 This set consists of 3 white metal parts: the pistol, holster and wood shoulder stock in a cello bag and attached to a header card that is all printed in Cyrillic Russian. I haven't a clue what MANOP translates to?? ​I got this set and 3 others in trade with a modeler in Warsaw many years ago.